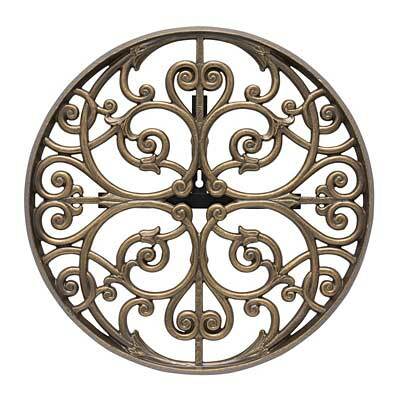 Add a distinguished element to your yard while keeping it tidy with the Whitehall Perrault Round Hose Holder. Intricate curves and scrollwork mesh with small pieces of foliage to create a truly elegant accent. The metal forms a loose screen, cleverly camouflaging your garden hose, and the French Bronze finish blends with any natural surroundings. This holder easily mounts to any exterior wall or flat surface with the included brace, and the three support rods keep your hose neatly in place. Place the Whitehall Perrault Hose Holder in your yard, and the heavy duty aluminum construction will keep your garden tidy, season after season. Made in the USA.